Update: As of December 2016, Ten at a Time has now given away $2,700 in allowance, birthday money and earnings from small jobs. Even better, this amazing group has added a second chapter – so there are now 20 Ten at a Time boys doing good in the world each month. 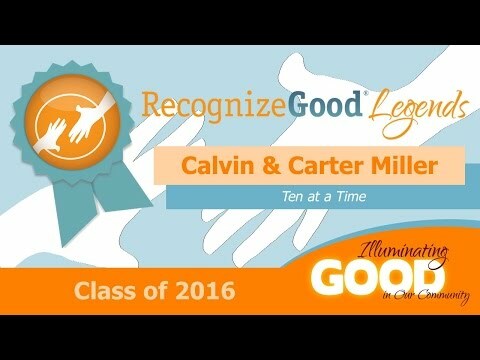 Calvin and Carter Miller learned the value of giving back at a young age, and once they decided to find their own way to do something good together in 2014 their impact has grown exponentially. After talking through their idea with their parents, the boys recruited eight friends to start a giving circle in which each member would donate $10 of their allowances or birthday money and take turns deciding where the group’s pooled $100 donation should go. They decided to call their organization Ten at a Time. After one round of giving, the ten boys have donated $1,000 of their own money to worthy causes around the world. As of December 2016, the boys collective total donation has now grown to $2,700 distributed to 26 different nonprofit organizations around the world. During their first year of giving, most of the boys draw from personal experience when deciding where each collective donation should be directed – a family member in the military led to support for military care package program Operation Gratitude, an up-close disaster relief volunteer experience prompted a contribution to Samaritan’s Purse, and a family member born with a cleft pallet inspired a donation to Operation Smile. Since then local nonprofits like The Locker and R.O.C.K. have benefited from the boys’ philanthropy. Once the money has been donated, the member responsible for that month’s decision leads the next meeting and tells the group about the good their donation has done. Ten at a Time has also supported rescued horses, rainforest protection, and children around the world who are orphaned or fighting malnutrition, hunger or lack of clean drinking water.